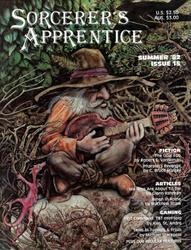 ARTICLES: Troll Talk - editorial by Ken St. Andre; Kingmaker - Mini-Solo Dungeon by Michael Stackpole; Firearms in T&T; Tunnelvisions by Ugly John Carver & Liz Danforth; Know Your Foe 101; Brother to Ghosts by Robert Vardeman; Weapon Experience by Gregory Courter; Heroic Fantasy by Ken St. Andre; Midnight Sun by Karl Edward Wagner; more. 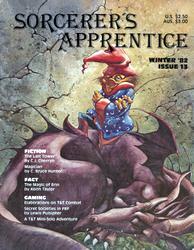 Troll Talk (Editorial: Ken St. Andre); On Trolls...and Others (Poul Anderson); Seven Ayes (Mini-Solo Dungeon: Ken St. Andre); Letters; It Aint Easy (Bob Liddil); Heroic Fantasy (Ken St. Andre); Flying Buffalo's DM Dungeons (Review: Martin Schlesinger); The Fair, The Four, and The Foolish (Fiction: Charles de Lint); Watership Down From The Bottom Up (Terry Ballard); Arcane Graffitti (News, Clues and Reviews); Basic Bibliography for Dungeon Designers (Ken St. Andre); The Basics of Tunnels & Trolls Combat (Liz Danforth and Ugly John Carver); Yggdrasil (Cartoon: Brian McCrary); crystallized (words by Lee Russell, unicorns by Victoria Poyser). 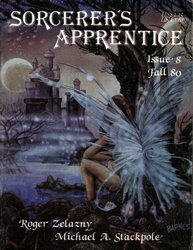 Kane: Essay - Steve Trout; Death Angel's Shadow - poetry by Karl Edward Wagner. 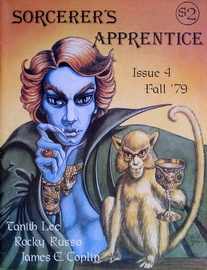 Editorial - Ken St Andre; Golden Dust, Red Death - a mini solo dungeon by Michael Stackpole; From Under the Mountain: a discussion of Dwarves by James E Coplin; Fantasy Gaming and the Interactive Videodisc by Terry Ballard; Arcane Graffitti - News, Clues and Reviews; Classified Ads; Monkey's Stagger: short story by Tanith Lee; Reader Survey; Letters; Reality Check: The Cowardly Arrow by Rocky Russo; Unbreakable Ties by Ken St. Andre - article on improving combat in Tunnels and Trolls; Weapons Shop by L.J. Harris The Adaga, a weird Moorish weapon. 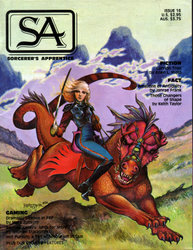 ARTICLES: A Sworded Adventure - Mini-Solo Adventure by Ken St. Andre; Individual Initiative in Solo T&T by A.D. Young; T&T Solitaire Adventure Design by Ken St. Andre & Liz Danforth; Passage to Dilfar (fiction) by Roger Zelazny; Revised T&T - An Overview of the Differences, Then and Now; Redcap (fiction) by J.E. Coplin; Dancing for the Death God (fiction) by David F. Nalle; more. 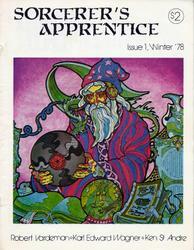 Tolkien in the Fourth Age; Queries and Quandaries; Fantasy Superfight; Arcane Graffiti; The Name Unspeakable in Tel Urath; Renlak's Do-or-Die Puzzle Room; more. ARTICLES: The Real Heroic Barbarian by L. Sprague de Camp; The farmers, chieftains, bard and pirates of ancient Ireland by Keith Taylor; Languages in alien tongues by C.J. Cherryh; Early cannon and gounnes: Them Black Powder Blues by J.E. 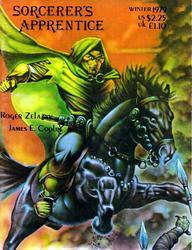 Coplin; Valkyries: amazons of the north; God & Golem, inc. (fiction) by Al Sirois; Thelinde's Song (fiction) by Roger Zelazny; Endgame (fiction) by Victor Milan; More adventures on Greysmoke by Larry DiTillio; The gold exchange in T&T by Paul O'Connor; A complete GM adventure AND a Mini-Solo for T&T; more. ARTICLES: Can These Bones Live? 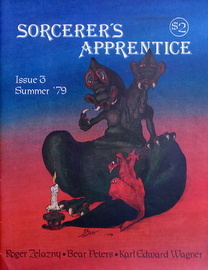 - a tale of John the Balladeer (fiction) by Manly Wade Wellman; The Monsters of the Cthulhu Mythos by Glenn & Arthur Rahman; Adapting Arduin Characters to Tunnels & Trolls by Ken St. Andre; Sleeping Champions by Samuel Davenport; The Black Dragon Tavern a complete GM adventure in the City of Terrors by Michael Stackpole; more. 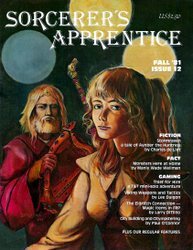 ARTICLES: Stormraven - A Tale of Aynber the Huntress, by Charles de Lint; Monsters Here at Home, by Manly Wade Wellman; Thief for Hire - A T&T mini-solo adventure; Viking Weapons and Tactics; The Eldritch Connection - Magic Items in FRP; City Building and City Mastering; more. ARTICLES: The Last Tower (fiction) by C.J. 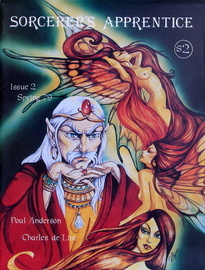 Cherryh; Magician (fiction) by C. Bruce Hunter; The Magic of Erin by Keith Taylor; Elaborations on T&T Combat; Secret Societies in FRP by Lewis Pulsipher; A T&T Mini-Solo Adventure; more. 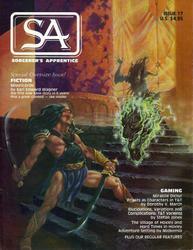 ARTICLES: From the Tree of Time (fiction) by Fred Saberhagen; The Sword and The Curse (fiction) by Lee Duigon; Ships of the Skies by John T. Sapienza, Jr; The Problem with FRP Games by Colin Wheeler; Devil Games? Nonsense! 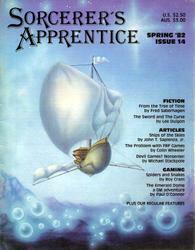 by Michael Stackpole; Spiders and Snakes by Roy Cram; The Emerald Dome a GM adventure by Paul O'Connor; more. 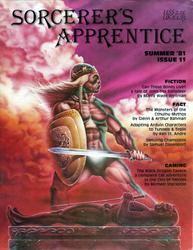 ARTICLES: The Opal Egg (fiction) by Robert E. Vardeman; Pharaoh's Revenge (fiction) by C. Bruce Hunter; We Who Are About To Die - Gladiators of Ancient Rome by Glenn Rahman; When in Rome - Gladiatorial Combat by Matthew Shaw; First Command - A T&T Mini-Solo by Ken St. Andre; Skills in Tunnels & Trolls by Michael Stackpole; more. 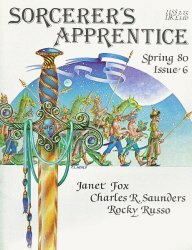 ARTICLES: Carrion Troll / Fiction by Allen L. Wold; Amazons of Antiquity by Janrae Frank; We are BLADE! from the Editors; Those Changers of Shape by Keith Taylor; Hot Pursuit a T&T mini-solo adventure by Michael Stackpole; Oathbreaker! by David Nalle; Dramatic License in FRP by Mark Zutkoff; Rogues' Gallery: NPCs for MSPE by Michael Stackpole; more. SPECIAL OVERSIZE ISSUE. 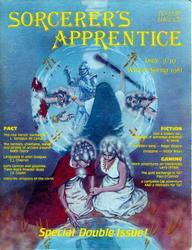 ARTICLES: Misericorde (fiction) by Karl Edward Wagner the first new Kane story in 6 years; Priests as Characters in T&T by Dorothy V. March; Elucidations, variations and Complications: T&T Varients by Stefan Jones; The Village of Hoxley and Hard Times in Hoxley Adventure Setting by Midkemia; more.